Price: See product options for price. 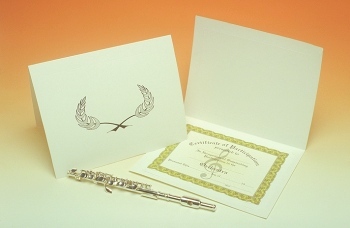 Die cut to accept 8 1/2" X 11" certificates, gold embossed wreath exterior, Smooth Gloss stock. Add an award ribbon and certificate for a prestigious effect.. Please define the quanitiy you desire before adding item to the cart. Click on the radio button on the right.